December 4 – remember the day? I do, my first new hip, home the next day, on my own from the start rebuilding my mobility and planning new experiences. This past weekend there were three things I wanted to do, each could have been a day trip, but I tied them together with two overnights. A first travel experiment, just as I did after back surgery. 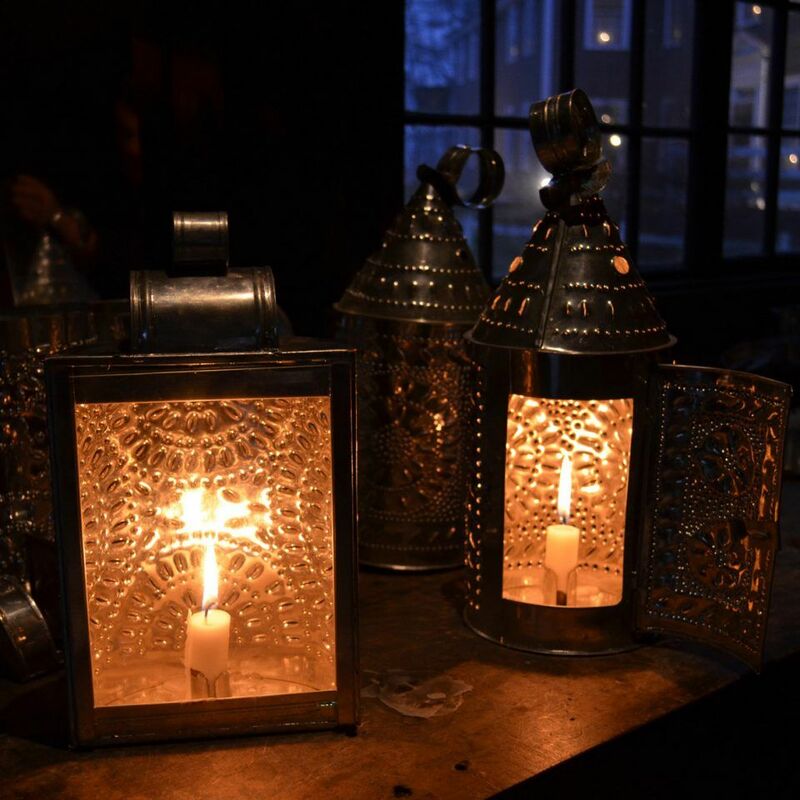 Tin Lanterns – OSV image. I attended Friday evening 25 January. 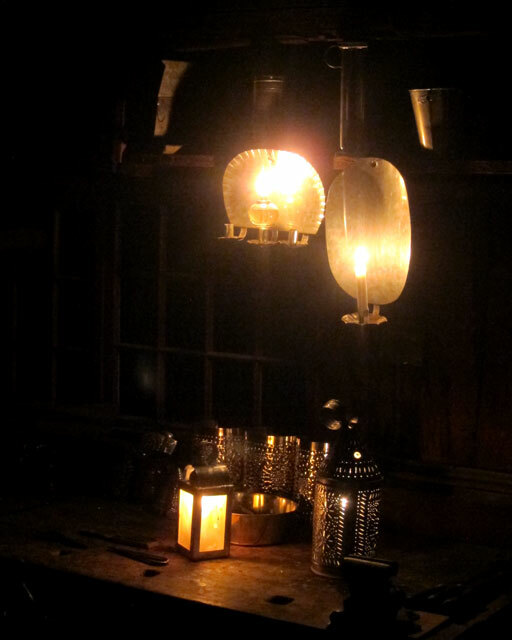 A sold out event at OSV, groups of fifteen are guided by lantern light around the Village Common for almost two hours, visiting several homes and shops to see how early New Englanders spent their evenings before electricity. 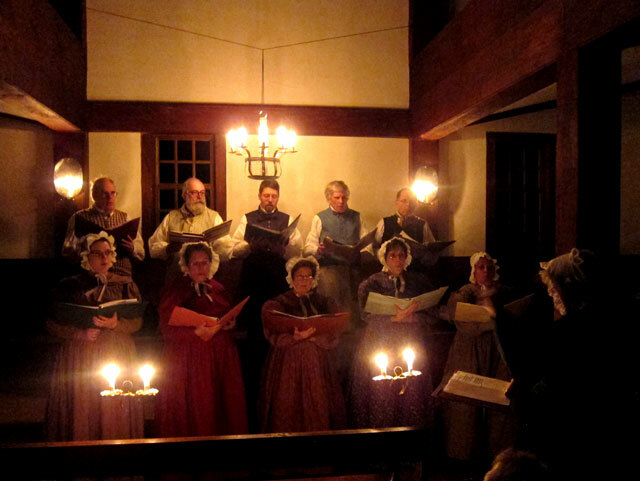 The village’s publicity goes on, “Visitors will be treated to music and storytelling throughout the tour, and will see Village artisans at work by candlelight. 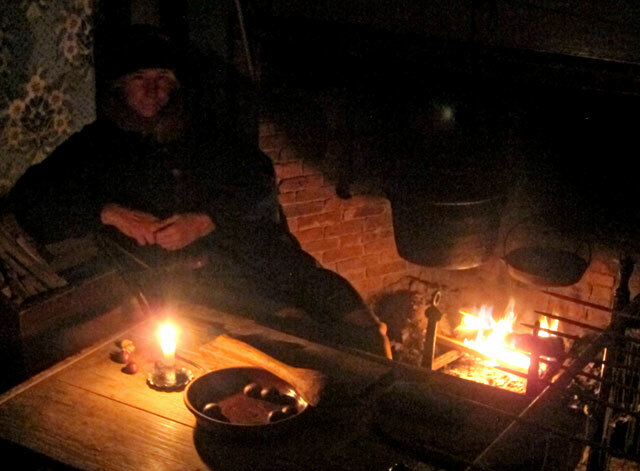 According to Old Sturbridge Village historians, early New Englanders stayed warm and productive during the fall and winter despite dwindling daylight and long hours of darkness. 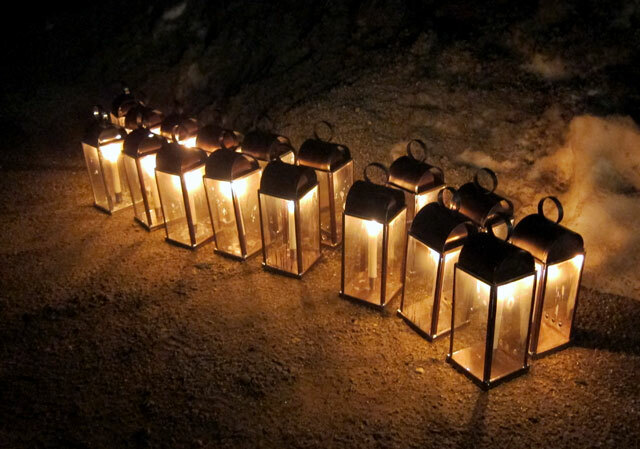 With light and heat coming only from candles, oil lamps, lanterns, and fireplaces, 19th-century families gathered around the fire and played music, games, or listened quietly as someone read aloud by candlelight.” You should, by now, know me and my affinity for candles, candlesticks, and all things flickering. I have now attended a number of special events at Sturbridge, enjoying each unique one. 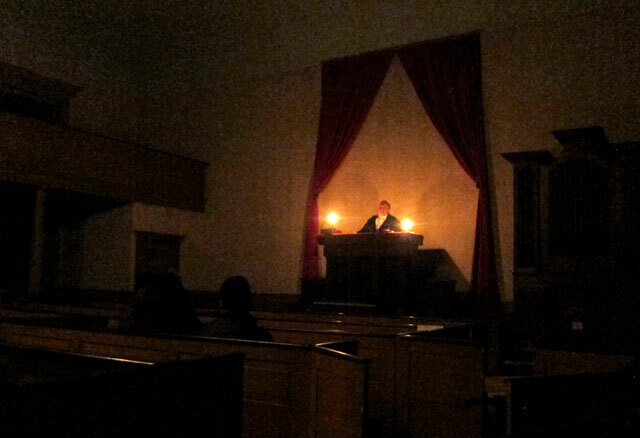 Unlike the evening Christmas program there was limited illumination to accurately replicate what 1837 would have been like — thus, my images are dark (would not be appropriate to use flash, and would not be a true representation – thus I do not have views of all stops to share. The route was basically counter-clockwise around the Village Common. The first stop, Isiah Thomas’ print shop, included a printing demonstration. But, printing at night would have been only in rare instances due to the cost of burning candles. 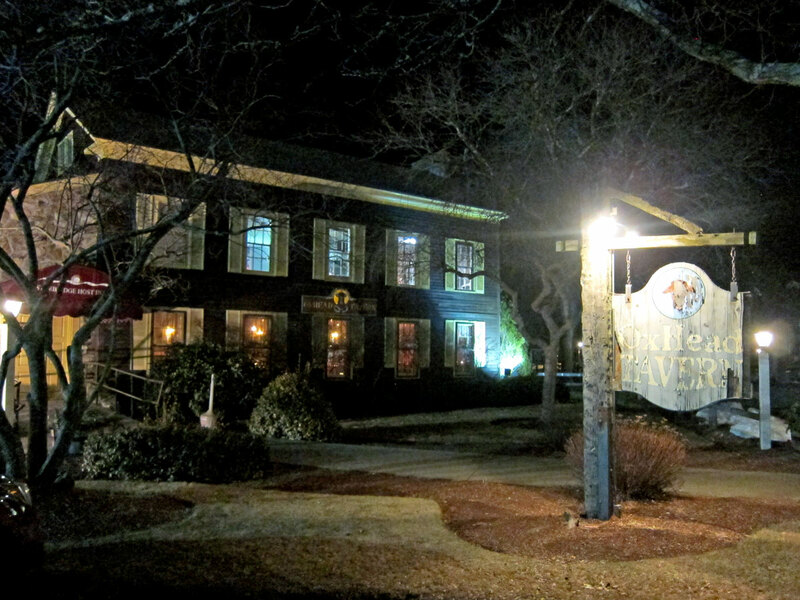 The next stop at the head of the Common was the Salem Towne House. 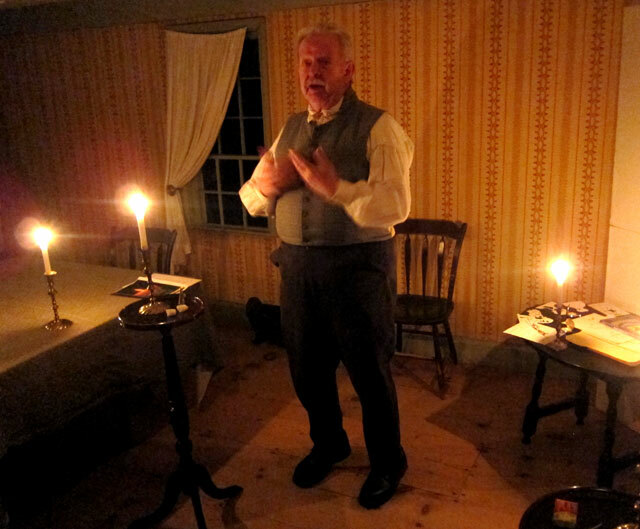 Here in the large central hallway we were entertained by a storyteller relating the ghostly tale of the cursed tomb in Bucksport, Maine. The Fitch House was the next stop. Brightly lit with a number of candles, and there was a reason. 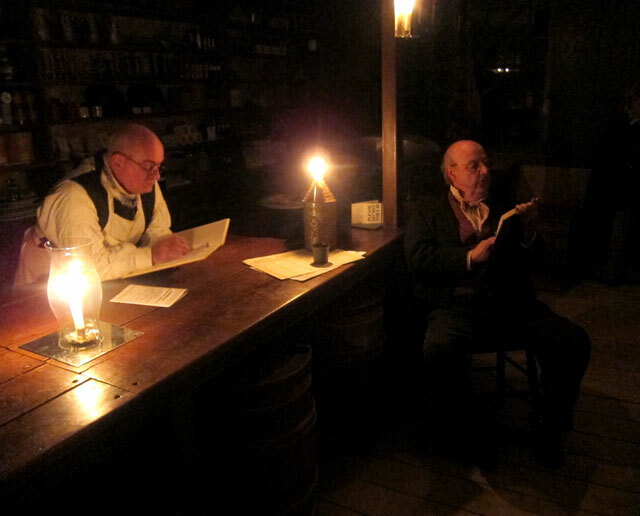 The docent discussed Michael Faraday’s, The Chemical History of a Candle, a series of six lectures on the chemistry and physics of flames given in 1848. 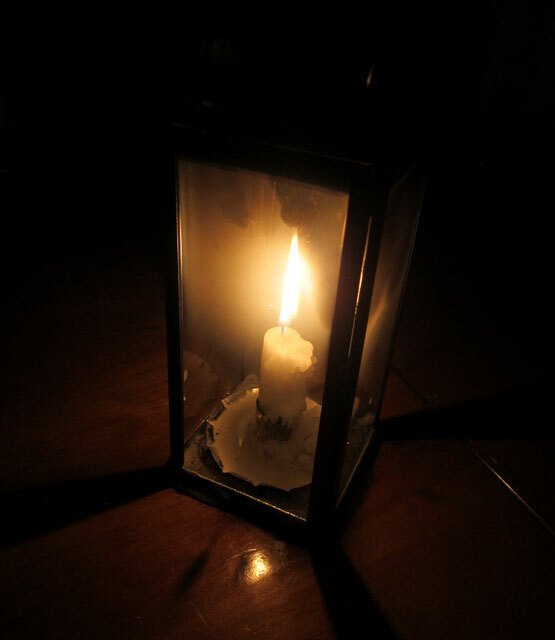 Bet you never thought about how a candle really works – I hadn’t. He encouraged us to google (not really a 19th century thing) Faraday’s candle, I have, and I encourage you to do the the same – there are even videos of the lectures. 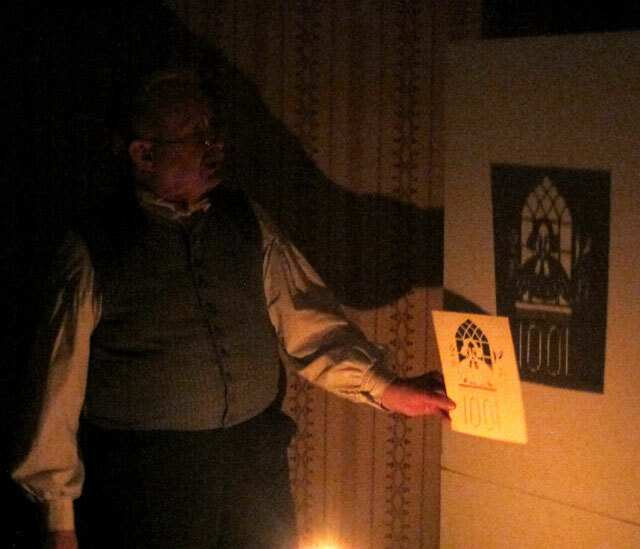 He then entertained us with stories illustrated by shadows projected on a white surface by candle light through cut-outs. This stop was worth the entire visit for me. 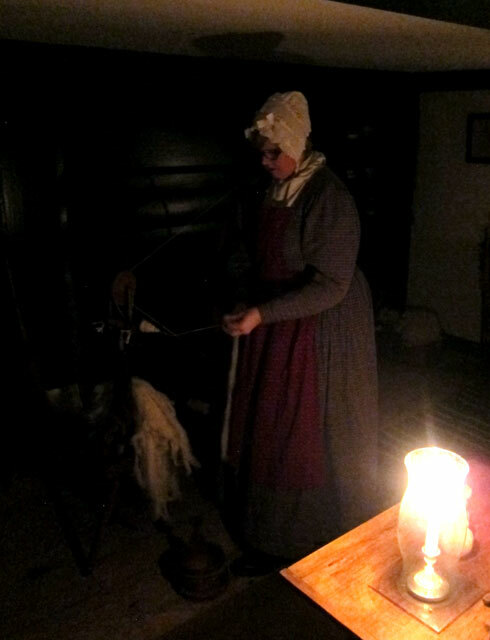 Stopping next at the Fenno House we saw spinning and knitting performed – also evening activities from the early 19th century. Very little light was used in these activities – so adept were the ladies that they could work almost with their eyes closed. Heading back to the Common the next stop was at the Friends Meetinghouse where singers were performing. They did three selections. I was entranced by their version of Yankee Doodle, which was written in 1847. I missed that on film, but decided to record the next piece for you. Next we entered the Center Meetinghouse where the parson was engaged in a lengthy oration. At the Asa Knight Store (you should know that I love old country and general stores) the clerk and a customer were settling their accounts. Each had debits and credits with the other (customers would often trade items with a shopkeeper). Usually once a year accounts were settled – cash paid, or the credit/debits carried forward. The “customer” below is Phil, who is the tinsmith in the village, and was my teacher in September in the craft. The village was not serving dinner this evening, so I headed to the Oxhead Tavern across the street. Lots of history about this building, I sat in front of the fire and had a nice pot roast dinner. End Hip Experiment Day One – almost three hours on my feet. Leaving Sturbridge Saturday morning I travelled a new to me southern route passing through Monson, Hampden, and Longmeadow to West Springfield and THE BIG E grounds. Hip Experiment Day Two – almost five hours on my feet wandering (and wondering) through 4 buildings (over 9.3 acres with just over 400,000 square feet), and all hard concrete. This, the 52nd annual show, is one of the largest, and I attended a few years ago. 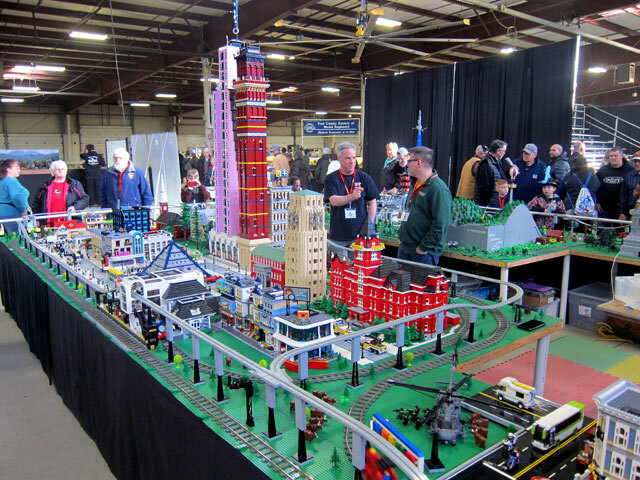 So much eye candy for model railroad enthusiasts – layouts constructed by various clubs, exhibitors with supplies to build scenery and buildings, new train equipment, and my favorite – old vintage toy trains. 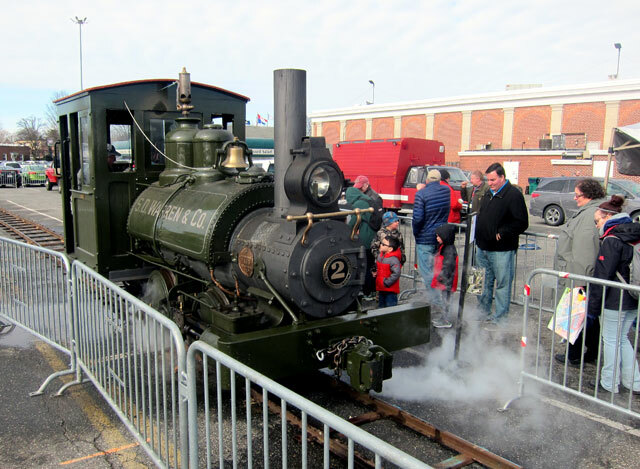 Greeting visitors outside was the Boothbay Railway Village recently restored S.D. Warren #2 0-4-0T locomotive. It was built by Baldwin Locomotive Works in 1895. Under full steam it was running back and forth on narrow gauge track (probably a Maine Two-Footer). I am just going to share with you some of the eye candy with brief explanations. Remember you can click on any of my galleries to open large size images. The cars below were in a very large scale – about $400 each, just having an image is enough. I love the real observation cars, and dining and Pullman sleeper cars. 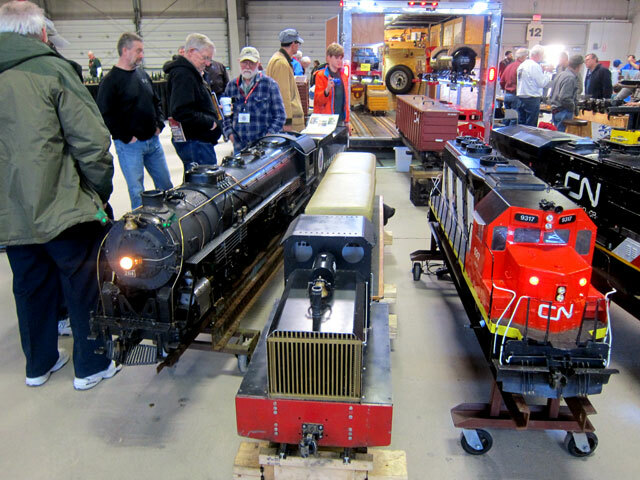 This club built its own miniature steam engines, and brought them to share. The two competitors – LIONEL on the left, and AMERICAN FLYER on the right. This dealer had nothing but the less popular AMERICAN FLYER, and no one was looking. It was then off to my B&B in Springfield to collapse and rest up. I headed out to scope out the MGM SPRINGFIELD casino. My neighbor asked me to take a look. Not my thing (note no images), and this is the report I emailed her, and recommend to you – “Don’t bother, unless you like low-end shopping mall atmosphere, food courts, and over (way over) priced faux restaurants with little glitz. Packed (Saturday night). Can say I have been there – same with glitzy Connecticut Casinos – been there – which I also never have to see again.” And, then back to sleep for Sunday. Hip Experiment Day Three – was about almost five and one half hours on my feet at the museum. But first I stopped at Springfield’s Union Station. 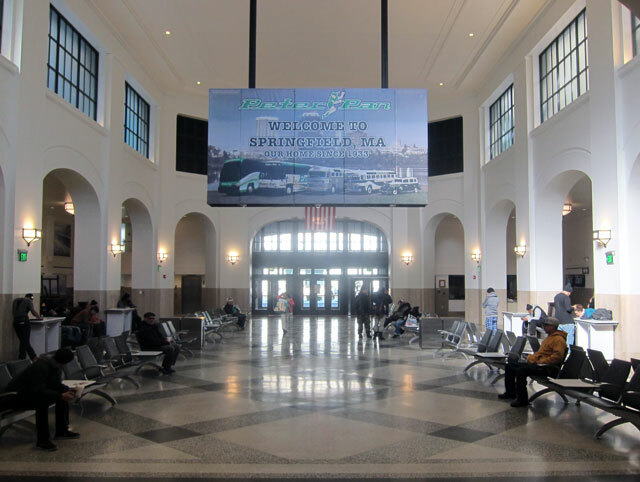 Springfield’s 4th station, built in 1926, handled up to 130 trains every 24 hours. When the Penn Central went bankrupt in 1970 it was abandoned, deterioration set in, and efforts to save the structure crawled. 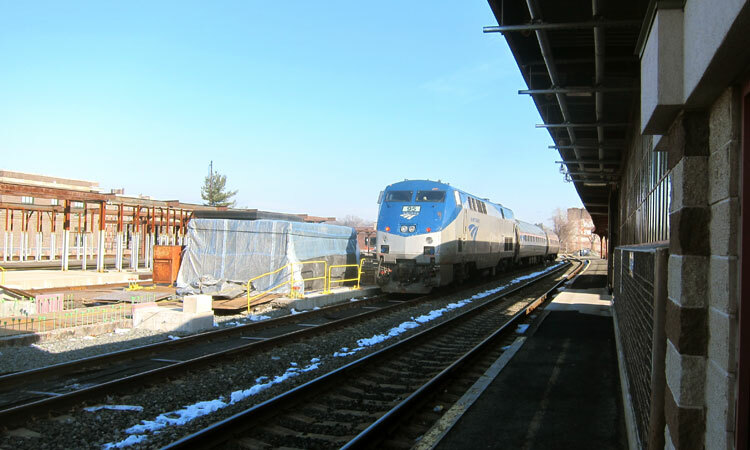 Redevelopment funds were obtained, work began in 2012, and the deconstruction and the reconstruction of Union Station lasted four years and one month, officially ending on December 31, 2016. The main hall was restored to close to what it was. If you are an automotive historian you should know what happened in Springfield. Do you? 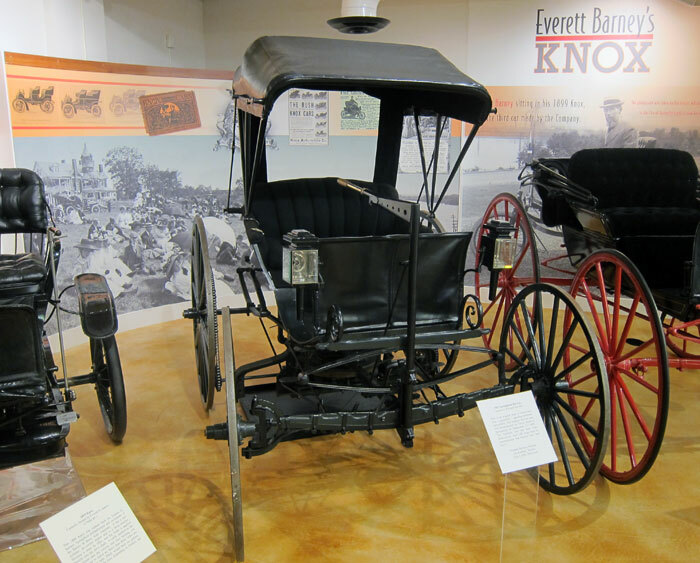 America’s first gasoline powered car was built here by two brothers, Charles and Frank Duryea, and on September 20, 1893, was successfully tested on the public streets of Springfield, Massachusetts. 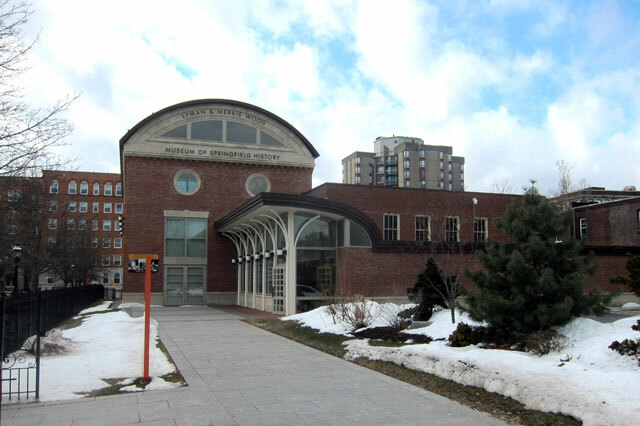 Near the train station is a park at 47 Taylor Street – the location of the Duryea’s garage. This model of their 1895 vehicle, which won the Chicago race in 1895, is in the middle of the park. 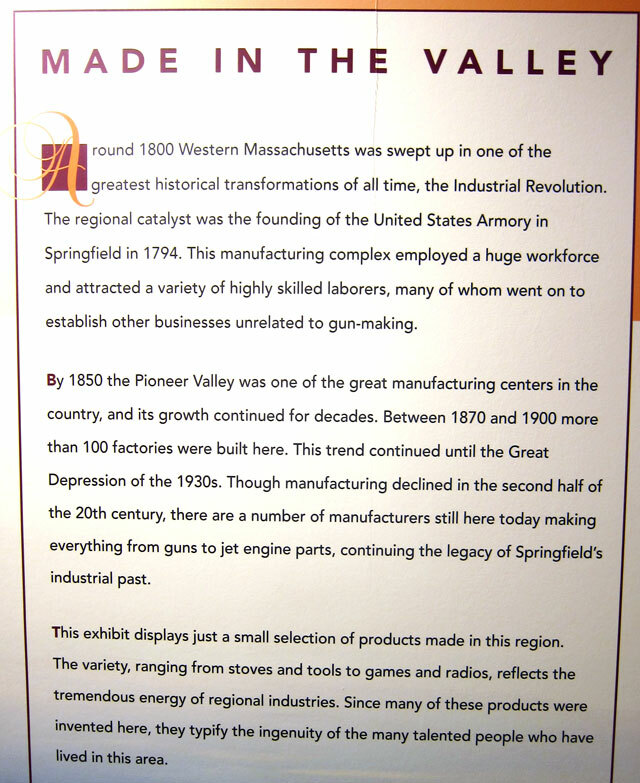 as you will learn at my final stop for the day, much has happened in Springfield, and industrial history abounds. Shortly after its Sunday opening time of 11AM, I arrived at the Springfield Museums complex and campus which almost adjoins the Springfield Armory, which I have twice toured. I started with the history museum – about 2 1/2 hours – and I need to go back. One of the best history museums I have been in – very informative, packed with local importance. Possibly wonderful because everything dovetailed with my interests, but I bet you would be captivated also. To give you a flavor, I am grouping a number of image galleries that you can open if you wish to learn more. The steps in making a tin toy. There are a number of Springfield related autos in the museum. For the 100th anniversary of the Duryea’s first gas powered vehicle this replica was built in 1993. Yes, the original was built on a buggy. 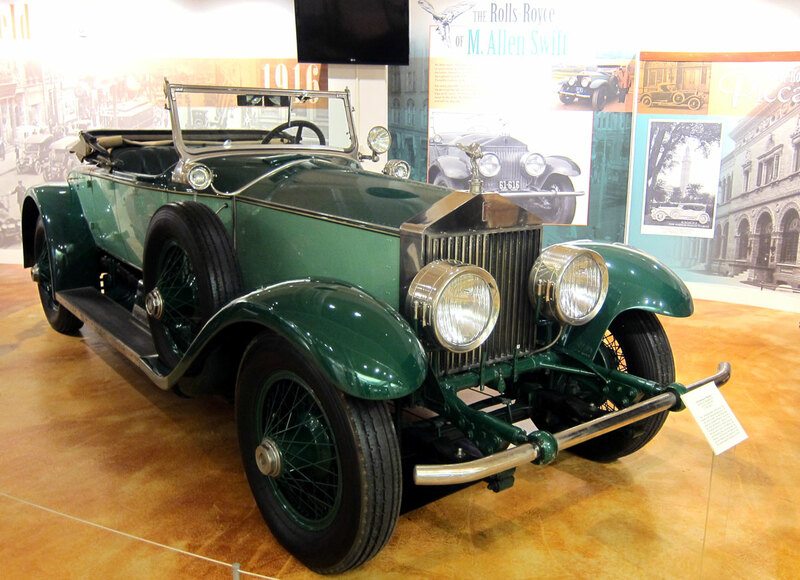 Did you know that Rolls-Royce also manufactured its luxury autos in the US – and right in Springfield from 1919 until the Depression? This 1928 Phantom has the distinction of having been owned by M. Allen Swift for 77 years – longer than any other owner in company history. He gave it to the museum just before his death in 1994 along with a major donation for the museum. I found it amazing all the products and inventions coming from this area. And part of the Milton-Bradley display. And, then there was the Indian Motorcycles – made right here in Springfield. So much history, here is but a sampling to entice you to visit and learn and drool. Born in Torrington, Connecticut, just north of the former home of Ray Boas, Bookseller, abolitionist, John Brown, spent time in Springfield solidifying his beliefs. 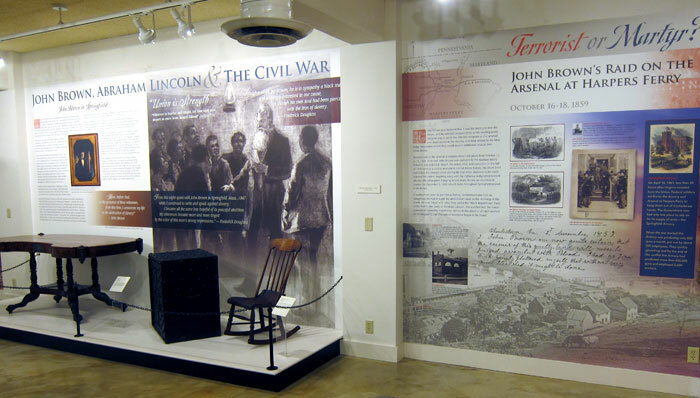 Ironically I have been learning about his raid on Harper’s Ferry, so found this exhibit of interest. Two major retainers started in the area. Friendly’s Ice Cream shops began with two boys with $50 creating a summer business. 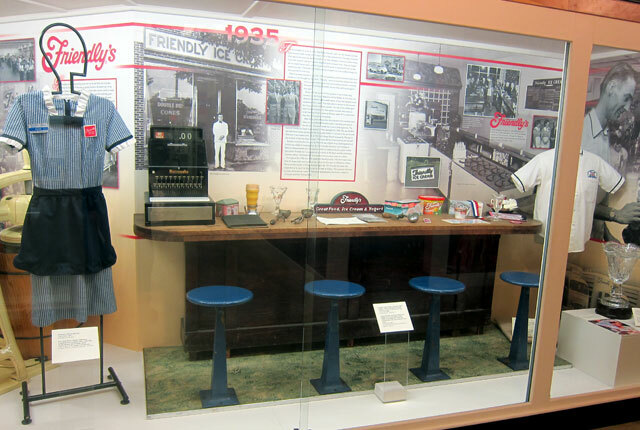 On display is the counter, stools, and other memorabilia from their first store. 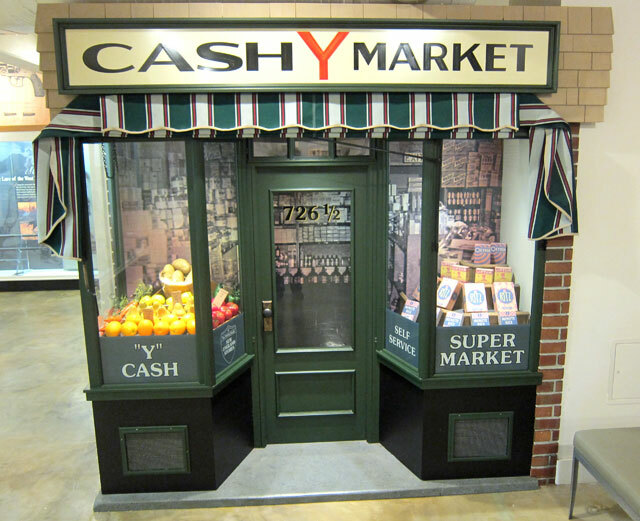 And, this store front is a replica of what became the BIG Y chain. 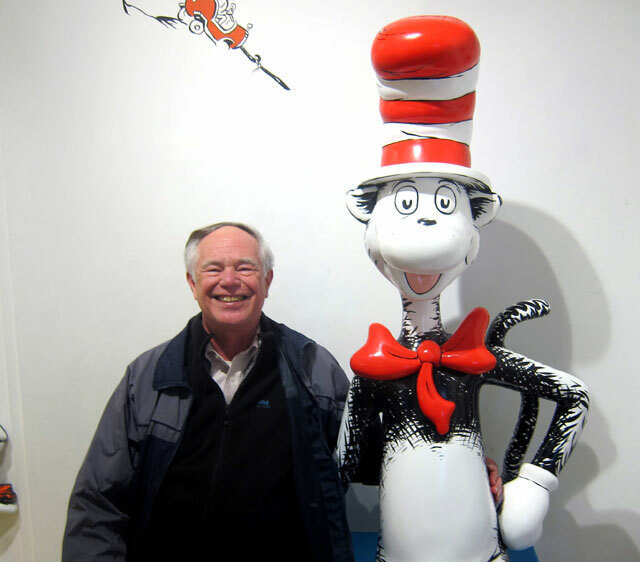 I then toured the science museum, but realizing I would not have time in one visit to get to the two art museums decided I had better at least run through the Dr. Seuss building. Originally from Springfield, many of his tales go back to his youth here, visits to the zoo, etc. It is impossible to not see this exhibit without a smile on your face. Outside is the Dr. Seuss Sculpture Garden. This is an image of a mural inside the museum of the garden. I hope you got this far — what I have related here are three “day trips” that I rolled into three days and two nights to save some travel time. 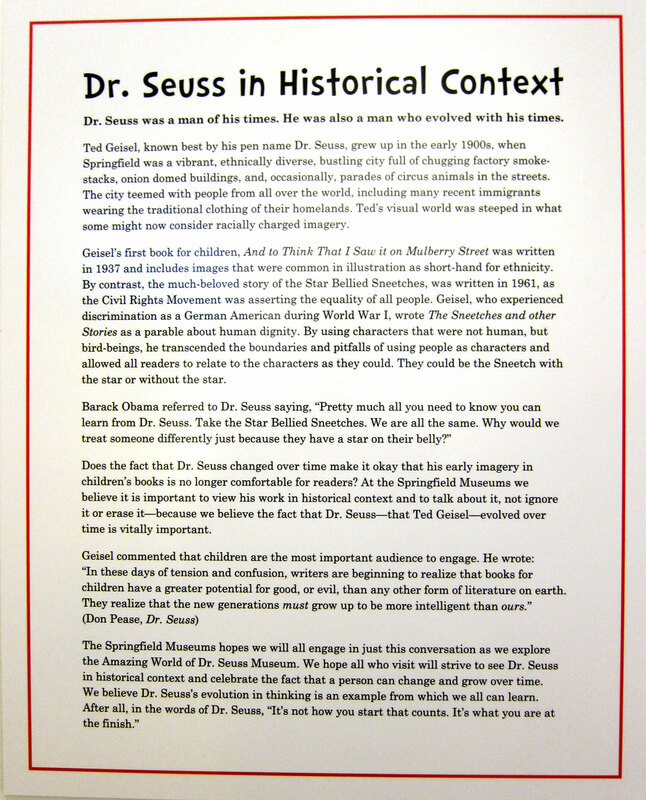 This entry was posted in Day (or maybe two) Trips and tagged AMHERST RAILWAY SOCIETY, Dr. Seuss, EVENING OF ILLUMINATION, MA, Old Sturbridge Village, RAILROAD HOBBY SHOW, Springfield, SPRINGFIELD MUSEUMS. Bookmark the permalink. Always interesting, Ray! I think I still have my blue Milton Bradley metal paint box like the one in your photo. The two boys that started Friendly’s were Mt. Hermon boys and attended my old school, Northfield Mt. Hermon. One Of the Friendly’s in Greenfield has (or had) paintings on the walls of the school. Glad your hip hold up! More road trips!! As always, Ray, fascinating information and great pics. Keep up the good work. Continually learning about the area through your posts. Thank you! Great post as always, Ray! That Springfield museum does look fascinating! 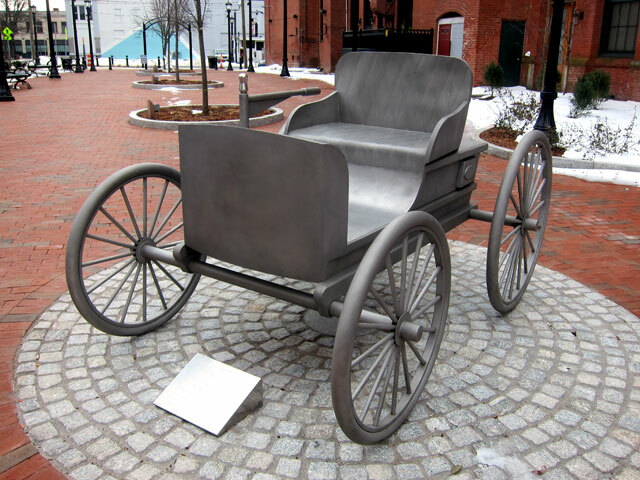 Just wondering if you’ve ever been to Lowell National Historical Park in Massachusetts. So much more than just a mill; it gets into the history of the industrial revolution.